Haverhill nipped in and got its own electoral debate this morning, ahead of the national one on TV tonight. The general election candidates from the three major parties, vying to be Haverhill's next MP, were in town for a debate of their own. Matthew Hancock for the Conservatives, Dr Belinda Brooks-Gordon for the Liberal Democrats and Ohid Ahmed for Labour had been brought together at Days Inn to meet local business people. Elaine Carr, who has just taken over the Best of Haverhill business website franchise, had invited them to the extremely well-attended re-launch meeting - with perfect timing, as it happened, on the day of the first televised prime ministerial debate. They were given five minutes each to present their 'manifesto' and then took part in a 15-minute question and answer session. The theme was Wanting The Best For Haverhill, and the candidates, as well as defending and promulgating their parties' national agenda, also talked about what they could do to help the town and its businesses. 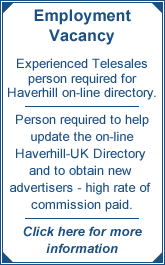 The candidates' three 'manifestos' were videoed by Haverhill-UK and can be seen on the TV section of this site. Mr Ahmed, who went first, is a cabinet member of Tower Hamlets Council in London and spoke about what Labour had achieved, and its aim to make the UK the best country in the G20 to set up businesses. He spoke of the town centre improvements his council had achieved in Tower Hamlets and how he could help local shops and businesses drawing on this experience. Matthew Hancock, a former chief treasury adviser to George Osborne, has recently moved to Thurlow since winning the strongly-contested Conservative nomination. He focused on what he called a real difference between the parties on how to rescue the country's economy, a divide which he thought was healthy for democracy. He then moved on to how the Tories would support businesses by removing barriers in their way, recalling how his own parents had struggled to bring their business through the last recession. He then spoke of the record of St Edmundsbury Borough and Suffolk County Councils in the five years since Haverhill had elected entirely Conservative councillors. He said the £20m investment by St Edmundsbury in Haverhill was the sort of commitment people could expect from a Conservative government at national level. Dr Belinda Brooks-Gordon, a Cambridgeshire county councillor and an author of the LIberal Democrat Women's Policy document, said she had lived in East Anglia for 27 years and her theme was 'bringing the best of Cambridge to Haverhill'. She spoke about her time as a beautician and when she had been a single parent bringing up two children while doing a PhD in the Law Faculty at Cambridge and said that experience informed her thinking now. She saw the Cambridge-based computer and bio-technology industry as vitally important to Haverhill. She also pledged that Lib-Dems would stop employers pigeon-holing job applicants by postcode and said she had heard of cases where Haverhill people applying for jobs had their applications bionned by employers as soon as they saw the CB9 postcode. In the question and answer session, Mick Smith of Haverhill Association of Voluntary Organisations (HAVO) asked how important the voluntary and charity sector was to the candidates. Mr Hancock said he was aware of the vital work done by HAVO and considered it very impoirtant locally, as partnership work was set to grow. "Tories would get power down to local organisations and trust people to run things locally," he said. Mr Ahmed said Tower Hamlets was the best example of partnership working in the country and he wopuld ensure strong partnerships were built in this area. Dr Brooks-Gordon Lib-Dems did not believe in the Tories' 'you're on your own, DIY model' and gave some examples of where Lib Dem-run city councils had helped community associations with grants and initiatives. "In West Suffolk we have parish councils where landowners are chairing meetings about planning developments on their own land," she said. "You can't put people like that in charge of things." She also pointed to the Tories on Suffolk County Council paying the 13th highest salary for its chief executive in the country. William Jewson of HPG Developments, the Cambridge company hoping to redevelop the former Project site in Haverhill, asked the candidates' views on planning and development in towns. Dr Brooks-Gordon said the infrastructure was important and she would like to see the Haverhilkl to Cambridge railway line re-opened, and would support the Cambridge guided bus project being extended to reach Haverhill 'once the contractual mistakes are sorted out and it is finally running'. Mr Ahmed said he favoured mixed development with plenty of open space and Mr Hancock said he supported development as long as it was appropriate and had the right infrastructure. * Also standing for the West Suffolk constituency in the May 6 general election are Andrew Appleby (Independent) and Ian Smith (UKIP). The current MP Richard Spring (Conservative) is standing down. At the last election he won with a majority of 8,909.